1. Salmon is mostly found in the Saint-Laurent seaway, including the Saguenay river, along coastal areas and in the many salmon rivers that drain into the preceding waters. 2. 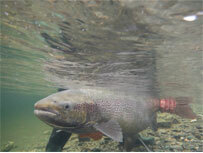 A sportfishing licence for salmon is required to fish in any salmon rivers. annual licence issued with seven (7) tags. day licence issued with a single (1) tag. 4. In addition to the general regulations that must be observed, fishers must also comply with regulations for each territory fished with a daily access. 5. This daily access is sold by the managing organization (Zec, Wildlife Reserve or outfitting operation with exclusive rights). 6. The cost vary from river to river and, on occasion, from one stretch to another of the same river. Free access is permitted on any other salmon river or salmon river stretch not managed by such organizations or located on private property. 7. 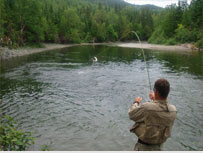 Certain stretches of salmon rivers are accessible for fly fishing only. 8. The fishers must use rods equipped with unweighted lines (only one artificial fly). 9. It is prohibited to engage in any kind of fishing activity in a salmon river from one hour after sunset to one hour before sunrise. 10. The daily fishing quota includes fish caught and kept. Unless otherwise specified , if the first salmon caught and kept is a small salmon, it is permitted to catch and keep a second salmon, small or large. No limit applies to salmon caught and released. 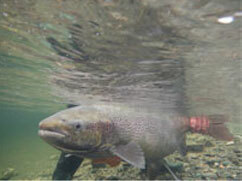 Small salmon : a salmon measuring less than 63 centimeters. Large salmon : a salmon measuring 63 centimeters or longer. It is prohibited to keep a salmon measuring less than 30 centimeters in lenght. 11. Anyone who catches and keeps a salmon must immediately affix a valid tag to it. 12. Anyone who catches and keeps a salmon must, within 48 hours of leaving the fishing area, produce his licence and have the fish registered by an authorized agent at a wildlife registration station approved by the managing organisation. Resident: Any person domiciled in Québec and having resided there for a period of 183 days during the year previous to their fishing activities or application for a licence. 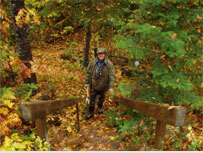 Non-résident: A non-resident must hold a sportfishing licence to fish anywhere in Québec.